The first thing to understand about a fundamental poker strategy is that — no surprise here — it’s built on fundamentals. Betting for value. Playing tight pre-flop. Veering away from bluffs and complex lines. It’s built to avoid what SplitSuit calls “FPS”, or fancy play syndrome. Everyone has been afflicted from time to time. The question is, when do we want to use basic poker strategy, and when do we think more outside the box? The most obvious answer is when you have very little information on your opponents. If you just sat down, or if you’re playing really good players, chances are you’ll be information-deficient for a good chunk of time. Reverting to a more fundamental style is a great way to adapt to a lack of info. When do you want to avoid fundamental poker? Again, not a big surprise — when you do have a lot of info, you can customize your plays to exploit player tendencies and mistakes you know they are likely to make. Otherwise you’re leaving money on the table. Use a Very Value-Focused 3-Bet Range – Default 3-bet QQ+ and AK. That’s it. Yes, it’s nitty — but only if you never deviate from a fundamental strategy, and we’ve already established there are times when you definitely need to deviate, particularly when you have information on your opponents. When that happens you can learn how to play more hands pre-flop and boost your win rate. Use Default Open-Raising Ranges – Fundamental play isn’t incredibly creative. It’s fairly predictable. When you do have information to act on, you can widen your open and calling range. When fundamental poker is called for, you stick to your set-in-stone open ranges. Use Default Bet Sizes – Raise to the exact same amount pre-flop. Every 3 bet should use the same multiplier or static number. Consistent bet sizing applies to post-flop play too. Whether it’s a 1/2 pot or 2/3 pot bet, always avoiding over bets, etc… fundamental, default poker is about bet sizing the same every time. Turn and River Bets for Value – Again, sticking with basic poker means avoiding fancy plays on the turn or river. Bluffs and semi-bluffs are not advised. SplitSuit points out that this is where the weakness of a fundamental strategy starts appearing, because situations of great value are going to be rare, and action scan become predictable. 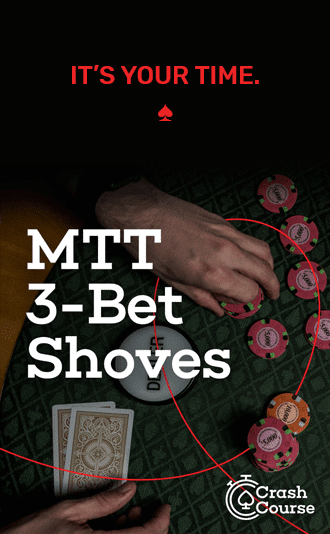 Betting turns and rivers thin, barreling bluffs and semi-bluffs… these are important tools of the winning poker player. Still, when you are playing a fundamental style, you will be doing very little of this — so work on gathering info to being forced to be too nitty. Pre-flop, so-called “ABC poker” shines. But when it comes to post-flop decisions, basic players tend to be a little too tight. Top pair, top kicker or two pair plus is just not going to show up enough times to make a value-first approach pay off in the long term. Anyone playing the slightest bit of attention is going to make you pay dearly for it. The point is, a good fundamental strategy is a good fundamental strategy, but it opens up to all sorts of weaknesses if you don’t have a component of your game to balance the fundamentals. You don’t have to change your whole game to break away from fundamental strategies and start to pick up some of the money on the table. It’s all about finding particular spots, or particular players to exploit. A basic strategy is supposed to be a default, not the gear you’re stuck in. Once you see an opportunity to widen a 3-bet range or bet thinner on turns and rivers (once you have some semblance of information), you need to deviate from the default and make an aggressive move. The other thing you want to be doing, now that you understand how to implement basic strategies, is to look for other players who are playing too basic. Just as you need to be mindful of the downfalls of playing this strategy yourself, you can exploit others who are sticking too close to the formula. Be careful pre-flop, but drop the hammer on turns and rivers. The later streets are a battleground where nittier players don’t often fight. Take advantage of their inexperience and do some damage with aggressive play. One thing I struggle a bit with is how to figure out the weak spots of other players to deviate from ABC poker, both live and online without hud (e.g. On bovada). What should I be looking for? Is there a starter checklist of things I should be looking for in other players when I sit at the table? Thank you for all the great content, looking forward to reading you more in 2016! You’re very welcome Ben! We should make a checklist like that at some point…but for now look for how tight/loose they are, if they play hands typically aggro or passive, and take note of any hands they showdown so you can try to reverse engineer their range and thought process. And most of all, when playing live poker, listen. Lots of players divulge a TON about their strategy when conversating at the table =) Cheers to you in 2016 as well! Awesome tips – thanks for sharing the info! Keep up the good work – never give up! Podcast cuts out at 16:20/19:19, no biggie, found it helpful towards starting to break out a bit, get the wheels turning. I just checked it and it seems to be working. Any chance you could try again? Glad you liked what you heard though Bruce!